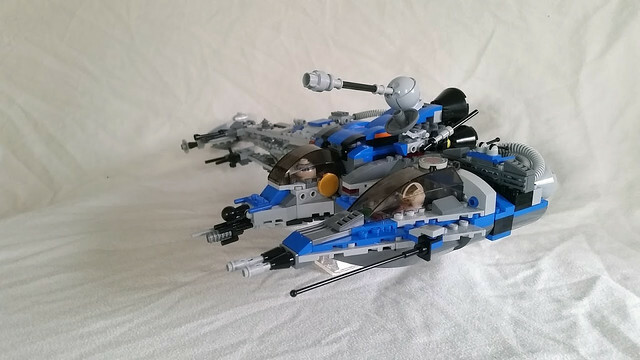 With backing from the Republic, the Resistance was able to upgrade their Y-Wing fleet. 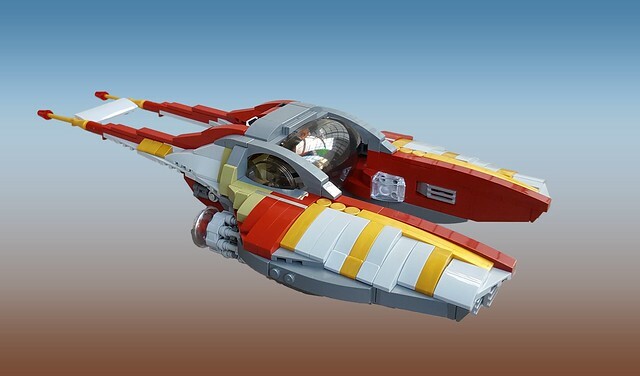 The design is a nod to the Clone Wars era Y-Wing with its armor coverings. 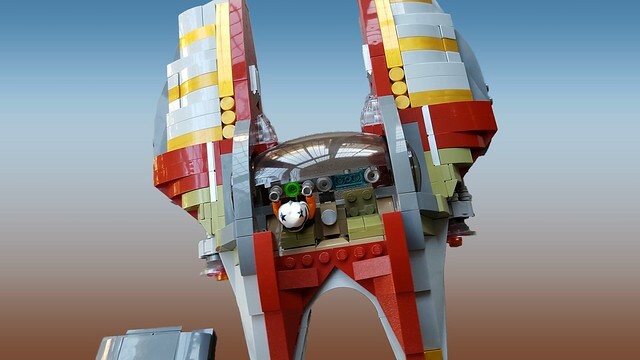 The new Y-Wing returns to having a gunner/bomber cockpit facing the rear and the cockpits are positioned in a way that resembles the ARC-170, with a BB unit in between them. The new engines are stronger and the coverings reduce drag, making this version faster than any previous model. 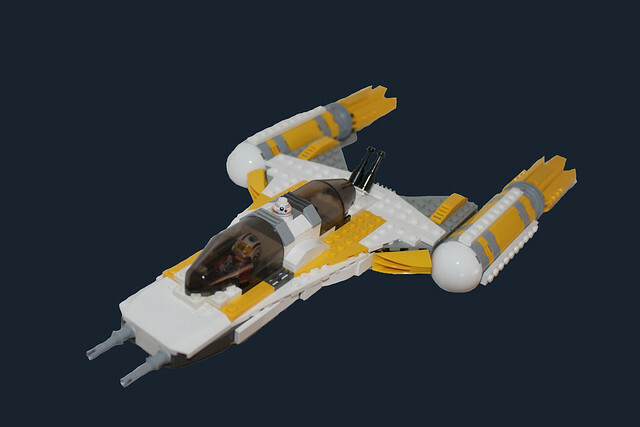 Regretfully the gold squadron fleet of Y-Wings weren't ready yet at the time of the attack on the Starkiller base. Thanks and best of luck to everyone! Really impressed by the building work and ideas everyone. I just hope i can get mine finished, have been working and reworking it. I am better at the idea than the build. Just keep plugging away at it. You'll get it there. 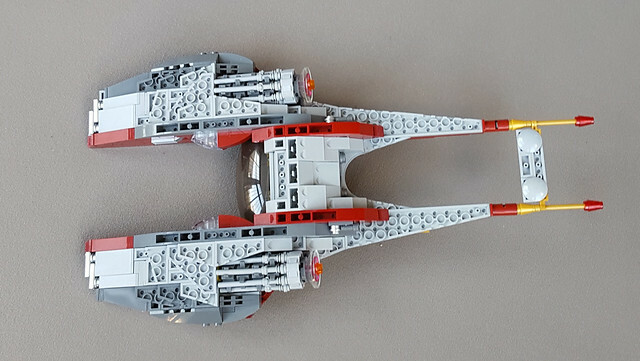 Hello everyone, my name is Ghalil and I have been a longtime lurker but this contest drew me out of the shadows of the interwebs and made me build something again after a very long time. 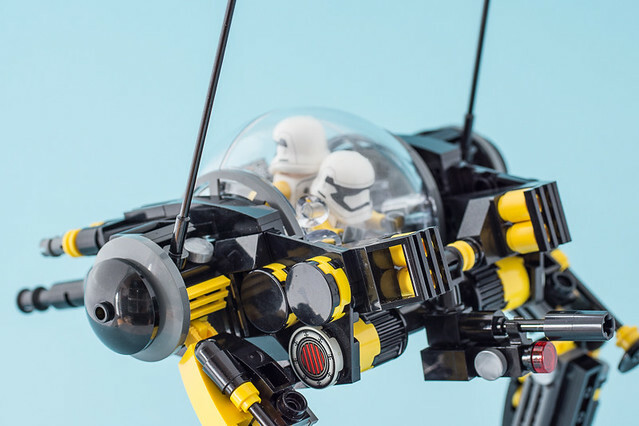 This custom speeder was built on the order of Kylo Ren, who deeply researched the life of the Sith lord that inspired him, Darth Vader. Only able to get bits and pieces of the early life of Vader, he still managed to have the newly built speeder honor the dark legacy of the Sith lord by incorporating elements of his podracing pedigree and the colorscheme of an infamous jedi starfighter. 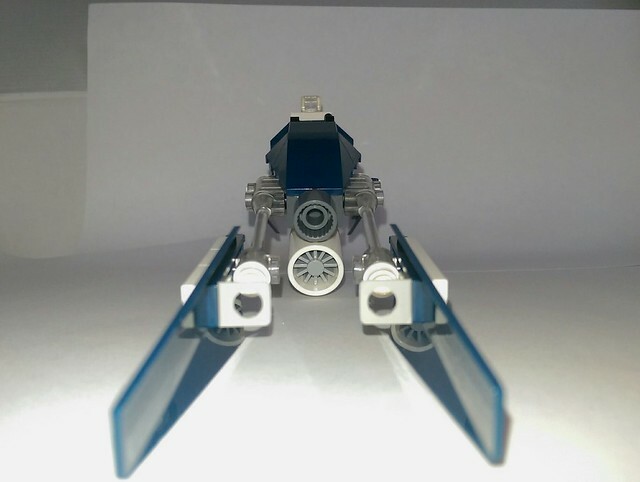 I have a few more pictures of the speeder on flick and I found a couple of my old star wars mocs which I'll upload as well when I'll find the time. 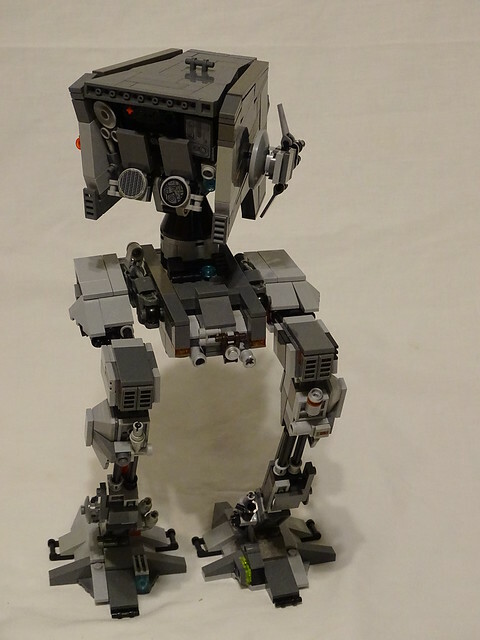 And finally I would like to say good luck to all the contestants, there are some glorious builds! 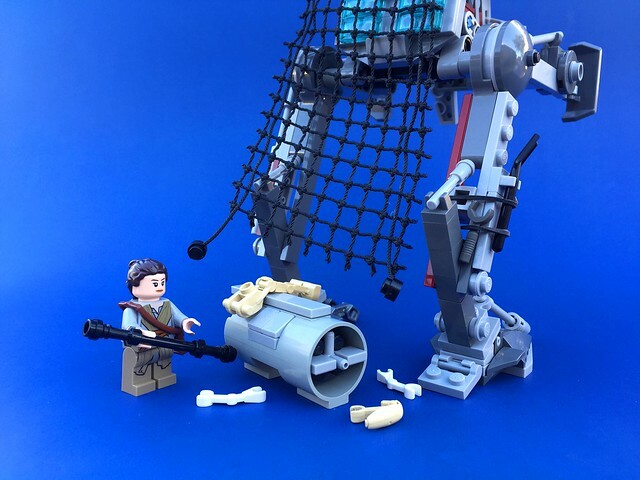 Before finding shelter in the ruins of an Imperial AT-AT, Rey once managed her scavenging via the wreckage of an AT-ST. 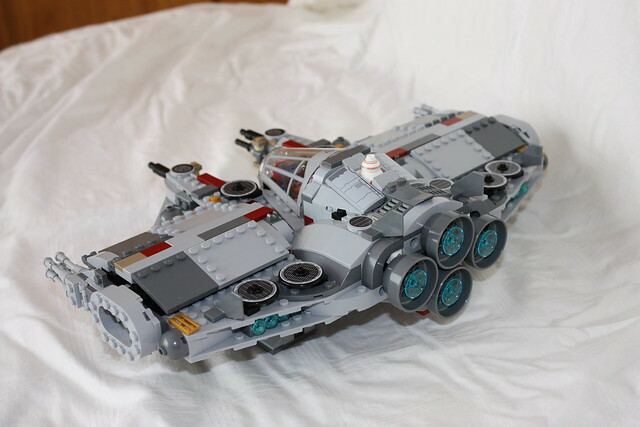 Though badly damaged, with an exploded cabin and no weapons, it was soon patched up and put to use transporting her across the more dangerous sects of Jakku. The transport served her well, and she continued to modify it with scraps and pieces until the day it was damaged by fellow scavengers and left inoperable. 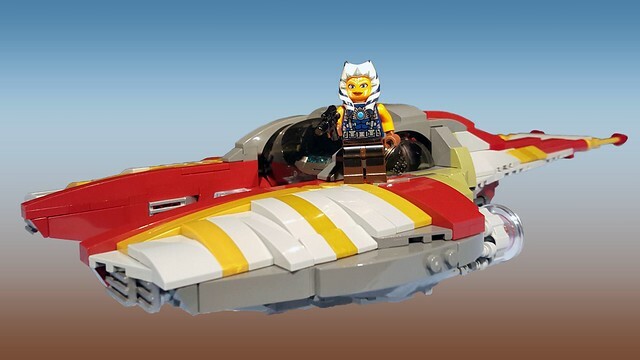 She managed to sell the remaining wreckage for a week's worth of portions, and continued searching for shelter until luck brought her to the damaged AT-AT. Fun contest--thank you guys for hosting! 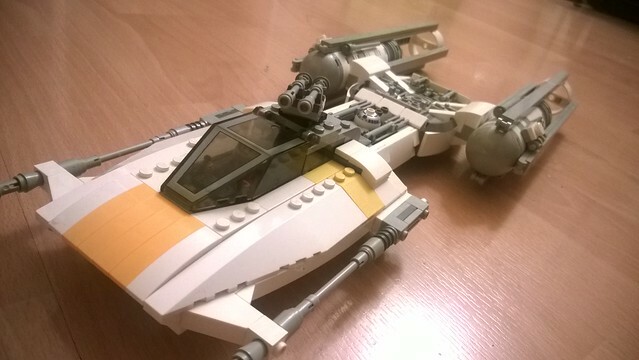 I was a little tired of the y-wings, so I decided to change things up. 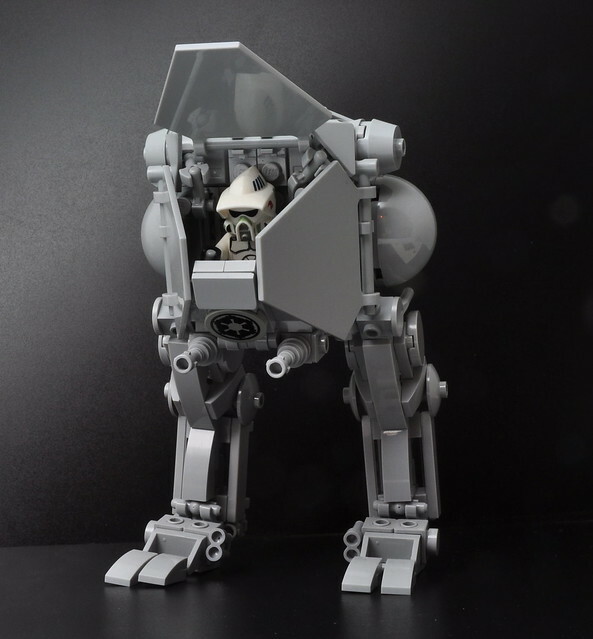 This is the official First Order AT-ST. It has fantastic upgrades that are great. Of course, it has the First Order signature red. And new weapons that are good at exploding Resistance soldiers. The sliding canopy makes easy access for any pilot to enter and exit. 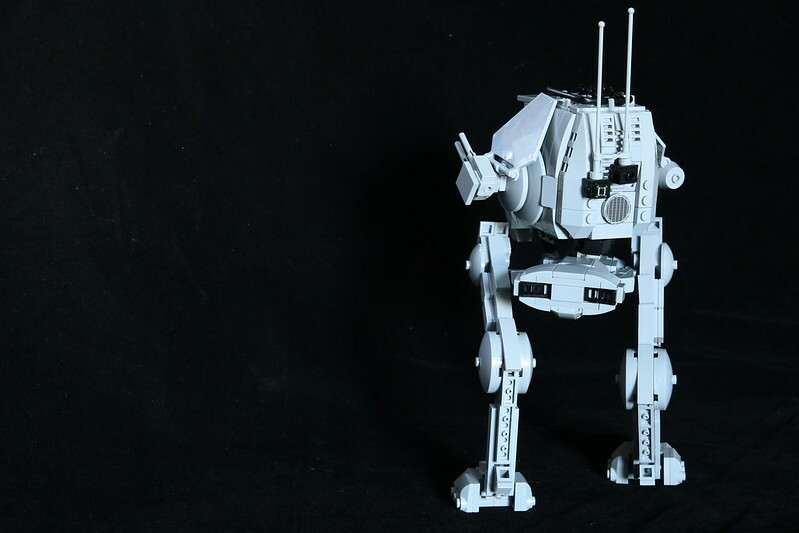 These walkers were originally deployed on Hoth so it seems fitting to have a snow trooper with it. What an inspiring idea and contest. Thank you FBTB for hosting! 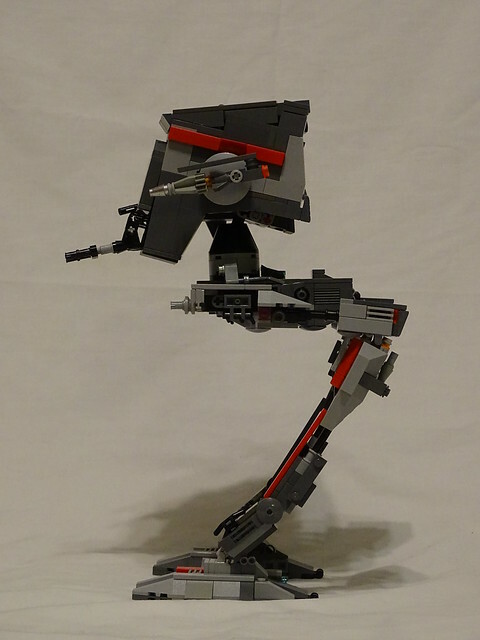 I'd like to introduce my entry, an evolved B-wing. 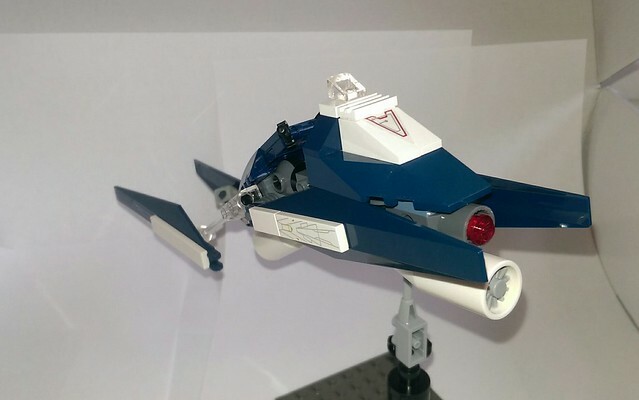 An offshoot of the original A/SF-01 B-wing heavy assault starfighter, the AS/A B-wing is a much larger ship. 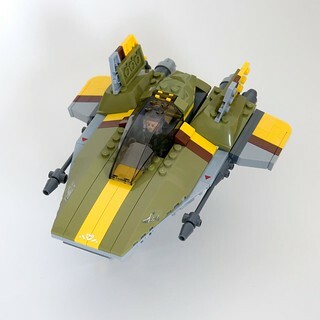 As the original B-wing was challenging to fly for even excellent pilots, this faster cousin adds an astromech droid to aid in all aspects of Air Superiority and Assault. Admitting the design was poor for dogfighting, Slayn & Korpil decided 'bigger was better' and offered this solution for blockade-busting and improved odds versus capital ships and orbital weaponry. The AS/A-B inherits its namesake's versatility in armament. 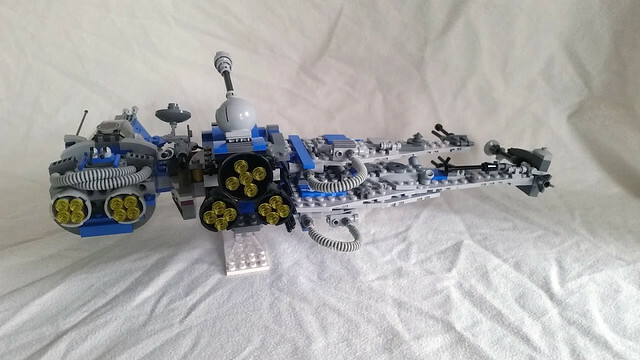 S-foils offer versatile hardpoints for an array of cannons, here shown with twin ion cannons and heavy lasers. At the far end of the cockpit in the main weapons pod are two proton torpedo launchers, two heavy gamma lasers, and a plasma cannon. 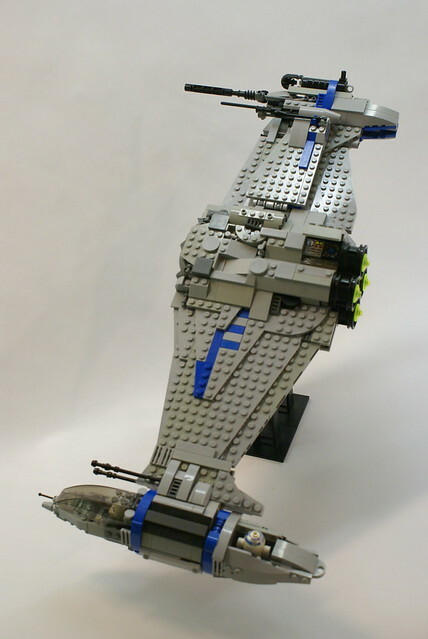 A pair of medium lasers are mounted near the rotating cockpit (included in the design despite protestations from the entire engineering team) and offer close-combat capabilities should dogfighting be unavoidable. Seismic charges could be deployed from the wing root near the engine exhaust; the energy plume from which masks the charges from would-be pursuers. 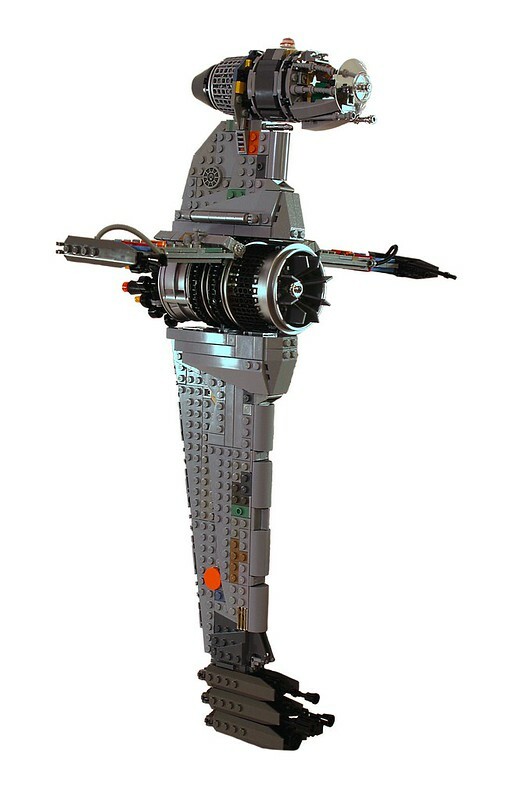 The uprated engines, avionics, and hyperdrive systems ensured this expensive vehicle was manufactured in limited numbers. However due to the effectiveness, versatility, and incredible power that could be brought to bear by only a single-seat fighter, the unusual configuration though 'quirky' had quickly earned the "B2" respect from both friends and foes. 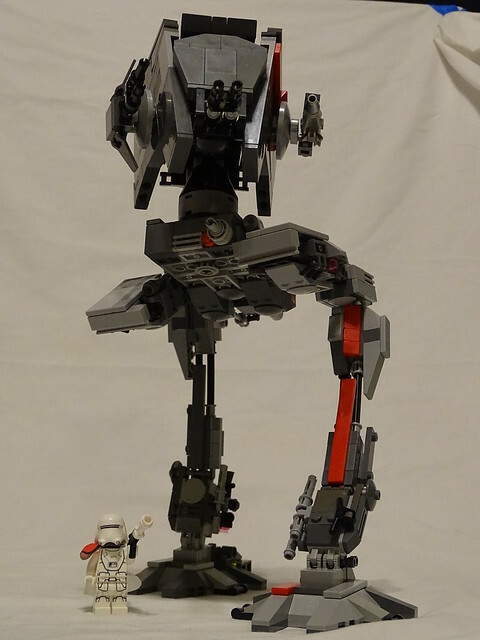 That said, I had a lot of fun building this. Both my kids (8 and 6) have played with it and it's fared well. The doors over two opposite engines open up to show the 'guts', the wings open and close, the two plasma cannons (technic spring-loaded rubber-tipped shooters) are a favorite, the cockpit easily rotates and both ends can pop off as an escape pod for the pilot and droid. 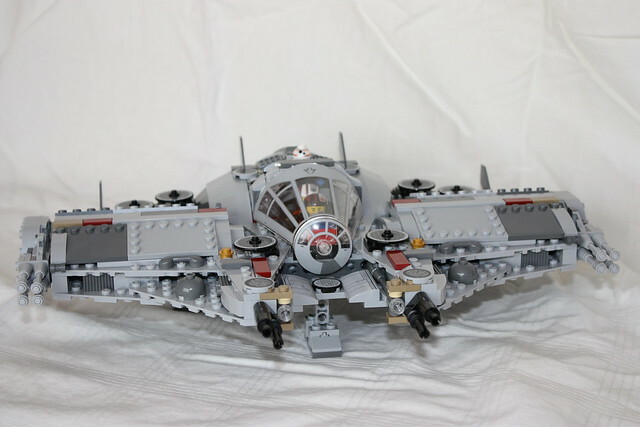 The competition is stiff- there are some really really nice models people have built. I'm happy to be in such good company. 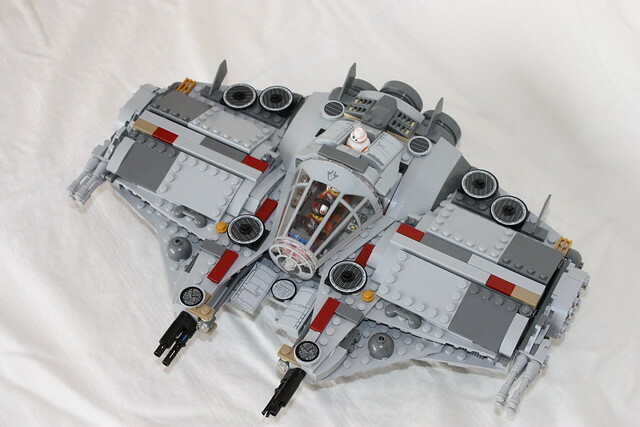 I have a few more pix of my starfighter on Flickr showing the S-foils open and closed, engine access hatch, cockpit, and overall views. Thanks! 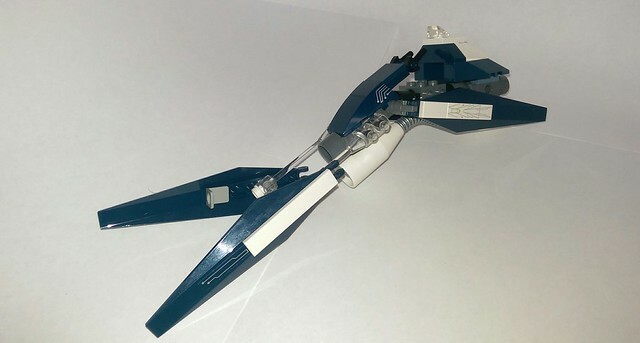 This heavy weapons variant of the A/SF-01 B-wing Starfighter upgrades the heavy weapons complement with a central blaster cannon essential in attacks for ever-larger capital ships from the First Order, with additional aft-mounted engines to boost speed and maneuverability. Innovative cabling routes excess power to the cannon and wing-mounted weapons systems, including the assault pod on the main wing. 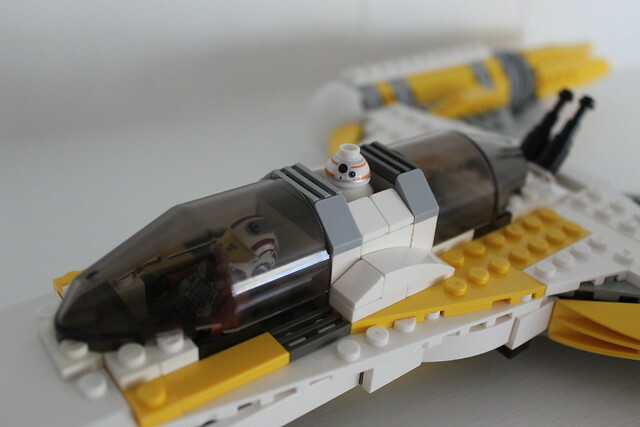 The advanced engine, power and cannon systems require astromech droid assistance in attacks, leading to the central droid cockpit that rotates in tandem with the pilot cockpit for synchronized maneuvers in flight. 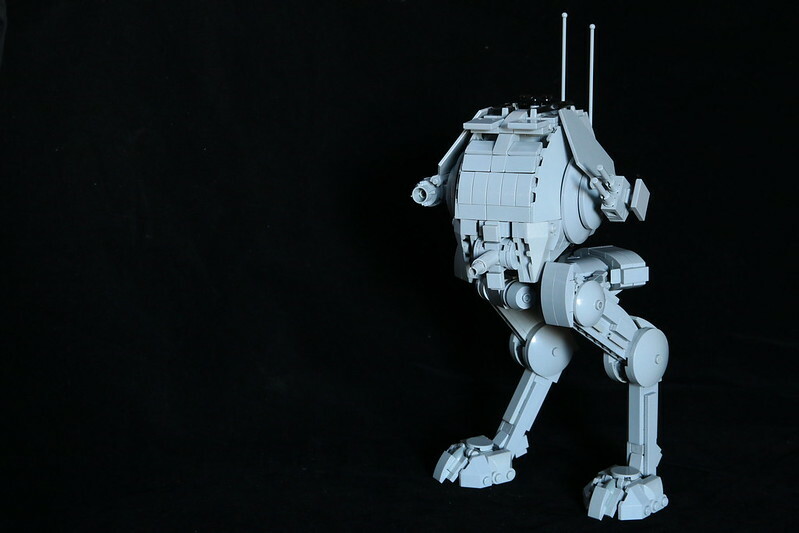 Evolve from the AT-ST & AT-TE to have a walker capable of fast movement like the small AT-RT and able to perform duty of both attack and defense. - Power shield to protect the Pilot and Co-Pilot, instead of heavy armor to reduce weight and provide unobstructed view. 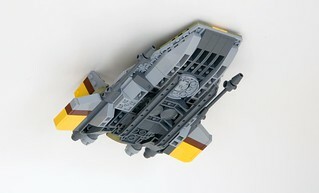 The reduction in weight provides an opportunity to increase it's power plant for the shield and higher fire power. - Virtual Piloting & Gesture Control with horizontal ground view point to provide quick reaction and movement control. Front: 2 x Mass-Driver Canon, operating in 2 different power mode. Low-power can be used during attack at walker mode. 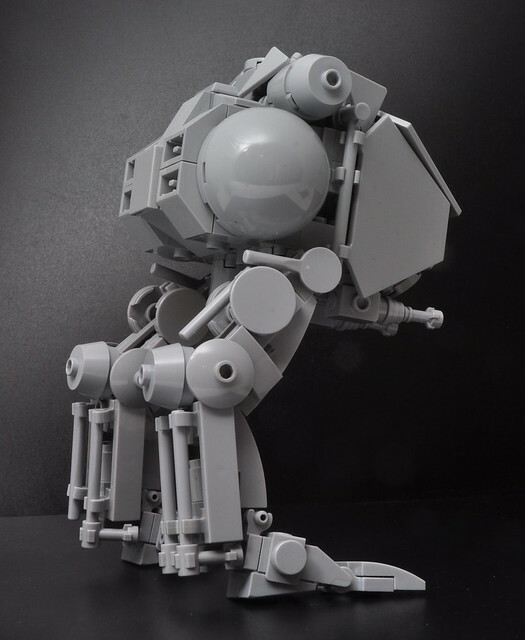 The high power mode requires the walker to be in lock-down mode, to handle the recoil during firing. Rear: 1 x Driver Canon for rear defense. Can be swivel to front for added fire-power. 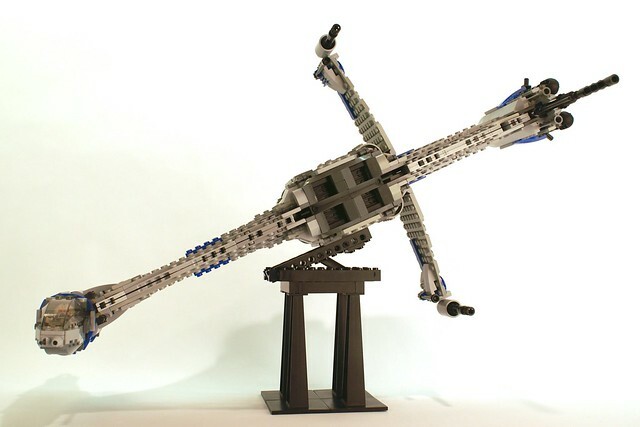 All armament can be rotated front or rear to provide fire powers at where it's needed. During retreat, AT-MTP brings up the rear to provide rear defense, as it's capable of providing full rear fire power firing while retreating. Lock-down mode is used during defense or when there's a need to provide heavier fire power to punch through the enemy defense. Taking a stroll, just like a cowboy with gun in the holster. 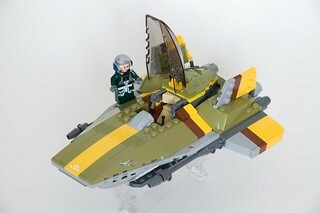 While the original Koro-2 speeder was always a favorite with the sky racing crowd, it’s drive system spilled radiation, which made it far from welcome in most urban environments. To this end Koro developed this version, which adds conventional engines and a rear stabilator, as well as a sleeker, more elongated shape. The dual mid-engine design means the craft retains its extreme maneuverability, even when not using the exodrive. Internal flaps close the air-intakes to protect the engines when not in use. The pilot may choose to utilize the exodrive, the engines, or both, allowing insane speeds. On a more practical level, the two drive systems allowed the craft to travel from urban areas to extremely harsh and dusty environments, making it an instant hit with mining executives. 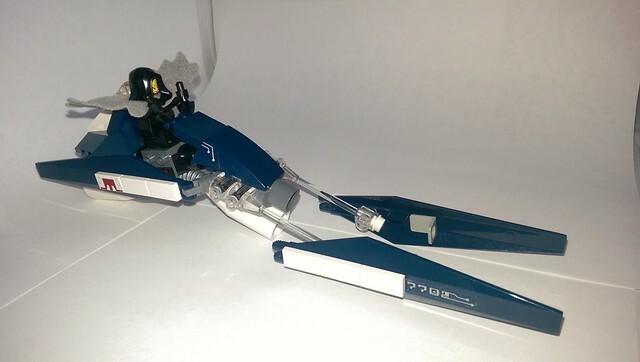 This is an evolution of the Koro 2 all-environment airspeeder, also known as Zam Wesell’s speeder, from Episode II. 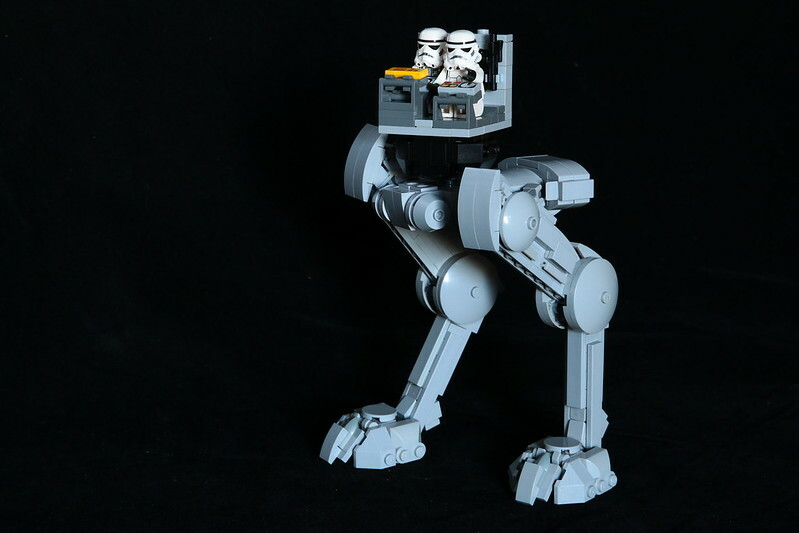 After a severe army-kicking by the small fuzzy creatures that make up the population of Endor, lawsuits were thrown around by the empire citing Kuat Drive Yards with providing inefficient armor plating against sideways logs attacks. 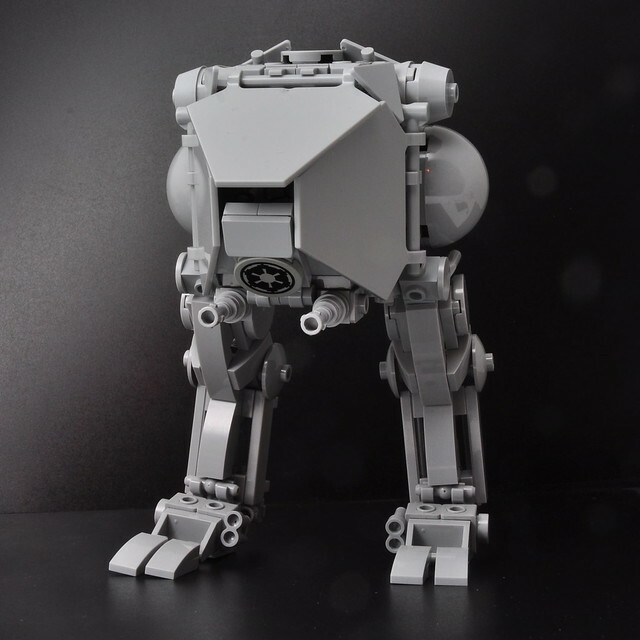 As a response, Kuat Drive Yards produced the All Terrain - Anti Ewok Walker as a direct "Up yours" to the empire's lack of accountability on Endor. 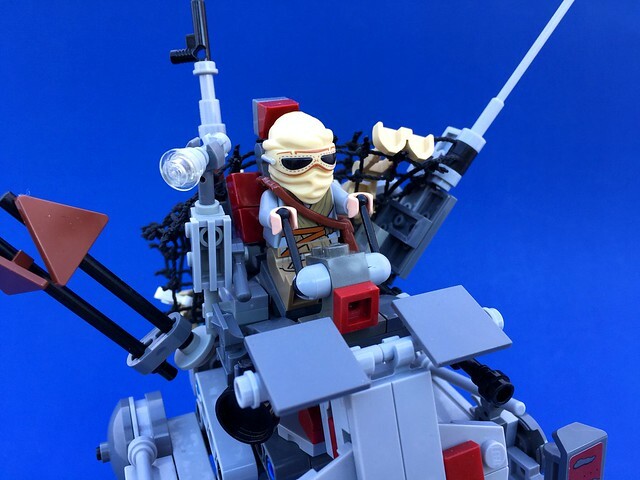 With heavier armor plating, sleeker cockpit design, and sensory array to detect movement in the blind spots of the cockpit, the AT-AEW is a newer, heavier, and overall more durable AT-ST.
AT AT- All Terrain- Tiny Transport. 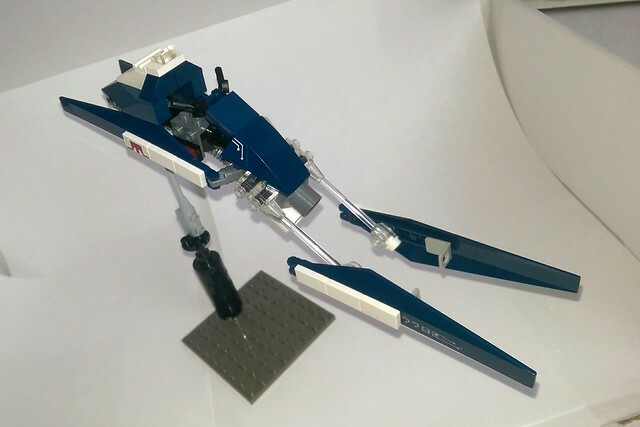 With the rise of Rebellions in planets with actual population centers, Kuat Drive Yards has introduce an urban model for of their famous All Terrain Transport series. SPOLERS TO FOLLOW: Following the attack on Starkiller base the Resistance realized that it's decimated X-Wing squadron would be no match for the First Order in a prolonged campaign. 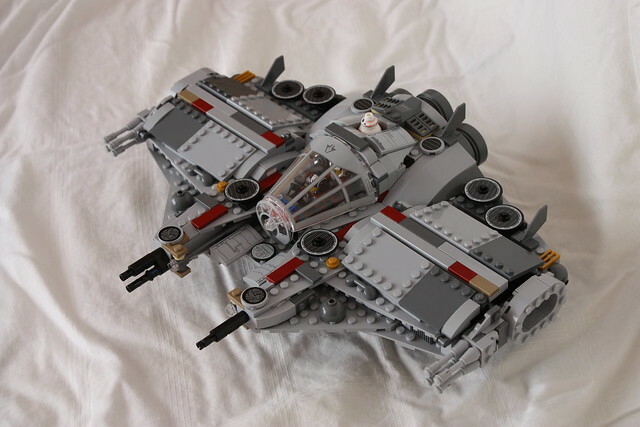 Realizing that they needed a highly maneuverable heavy fighter capable of delivering knock out blows to capital ships and planet sized bases the Resistance, inspired by the reemergence of the Mellennium Falcon, turn to the engineers at the Corellian Engineering Corporation. 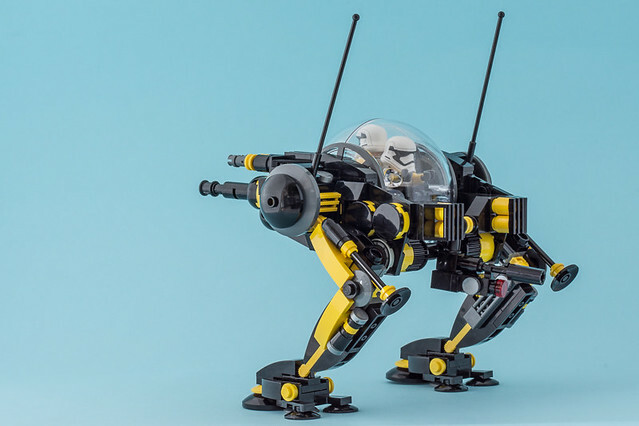 The resistance's best pilot was sent to consult on and field test the new design. 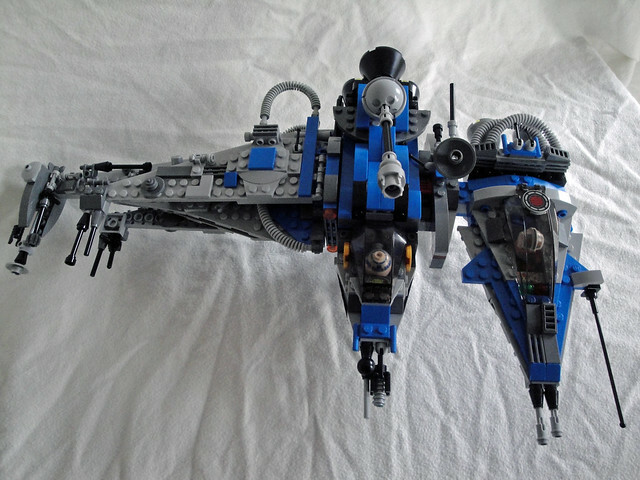 I now present the Corellian HF-50 heavy fighter. 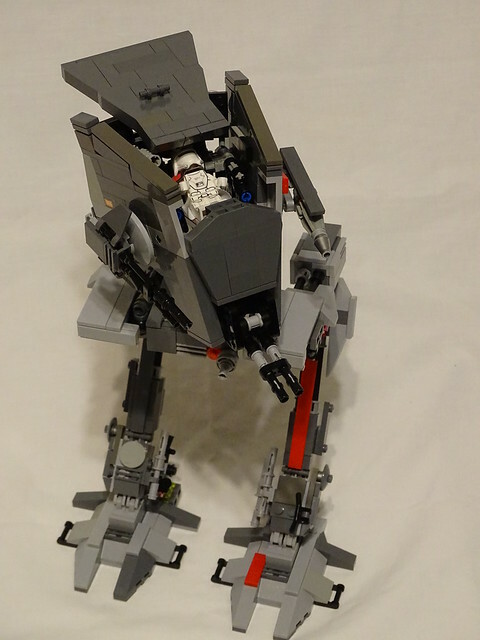 It is equipped with dual front facing quad cannons and two heavy turbo lasers, and quad projectile launchers on its underside. The HF-50 has deviated from traditional Corellian designs in that it lacks the distinctive dish antenna, at Poe's request this was replaced with a more effective integrated sensor suite comprising of four distinct radomes (two on the front, two on the aft quarters). 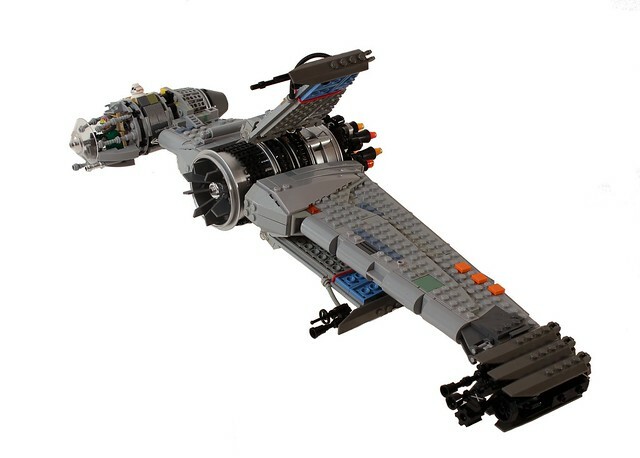 Additionally, being a heavy fighter and of Corellian design, its maneuverability is almost on par with the X-Wing. In order to maximize the power of its armament, and keep size to a minimum, the decision was made to keep the quad lasers fixed in the forward position. 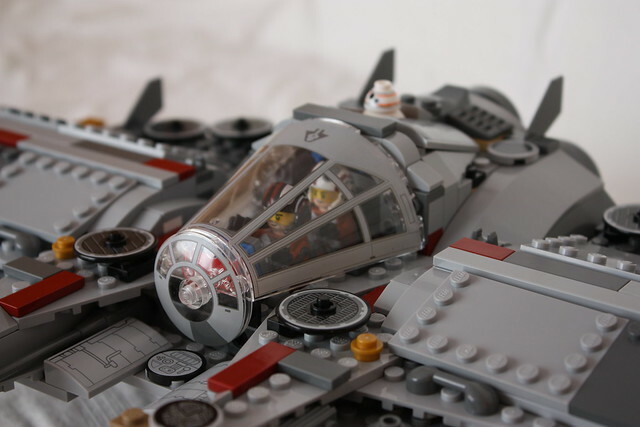 The ship has facilities to support two pilots and an astromech for extended duration missions deep in hostile territory, in a pinch it can accommodate a up to four people total for rescue missions. 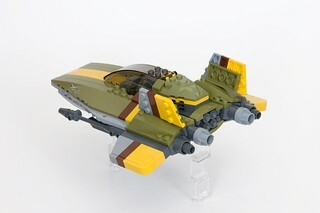 Since inspiration was pulled from the most popular (notorious) freighter in the galaxy, the HF-50 was equiped with the most powerful engines ever utilized for a vessel of its size. 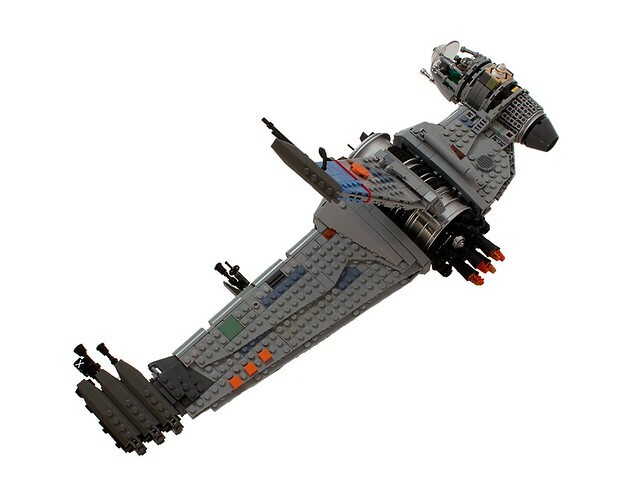 It too can complete the Kessel run in under 12 parsecs (sic). I am totally new here and signed up just for the this competition. I hope to be back for more. Thank you !!! Long distance reconnaissance vehicle with muted colors and sharp manoeuvrability, but few weapons. Less than 11 hours to go! Lots of late entries like usual, so if you're one of those people and happen to be a new member it's important to know that any posts from new accounts are subject to moderator approval. So when you write everything out and click submit and it appears to work but doesn't show up in the thread - don't panic. It's there, we just have to double check it before anyone else can see it. Spam reasons. As long as you click submit before the deadline and you've followed the rules you're fine. The post time is when you submitted it, not when we approve it. That said, please post earlier rather than later so if you've made some mistake it can be fixed in time to qualify. There's still at least one entry that looks great but won't make it in unless the builder fixes his images and uploads them to Flickr. The rules clearly state that we rely on their image sizing codes to make our posts so any other host won't work. I hate when things get left out due to somewhat minor technicalities but it always seems to happen. ... and featured in the classic kitchen colors of the 70's that many of us old timers remember all too well; avocado green, harvest gold, and burnt umber! 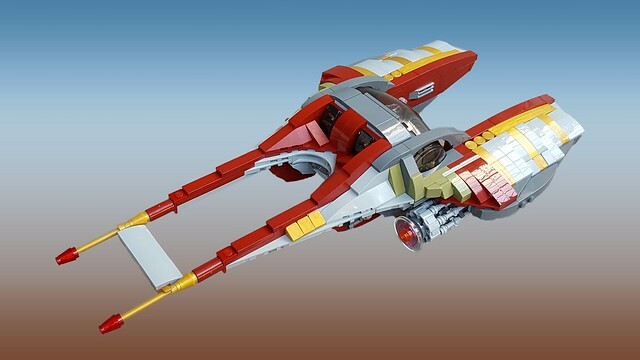 Looks like a lot of people have made their own Y-Wing, no originality point for me either. The S-foils revolve around a quick-change reactor tube: mount the engine best suited to your mission in a matter of minutes instead of hours. Making a tight atmospheric turn in urban combat? No problem! The independent S-foils can remain horizontal even while the primary airfoil drops out of vertical, giving you that little extra lift that might just make all the difference! 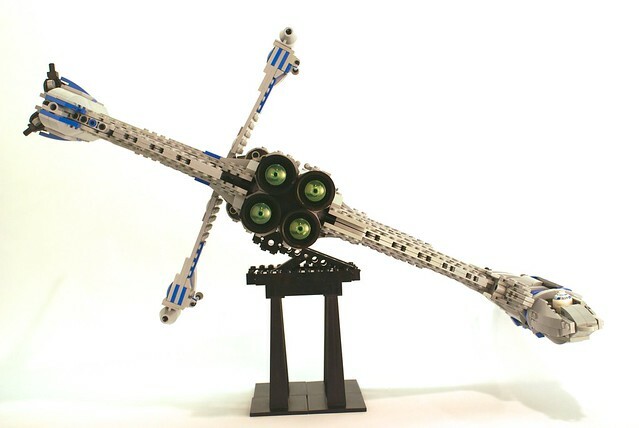 The 6 fusial thrusters provide much-needed redundancy in battle: thrust vectoring is maintained even in the face of a disabled thruster, and straight-line thrust remains available even if any two thrusters are taken out. 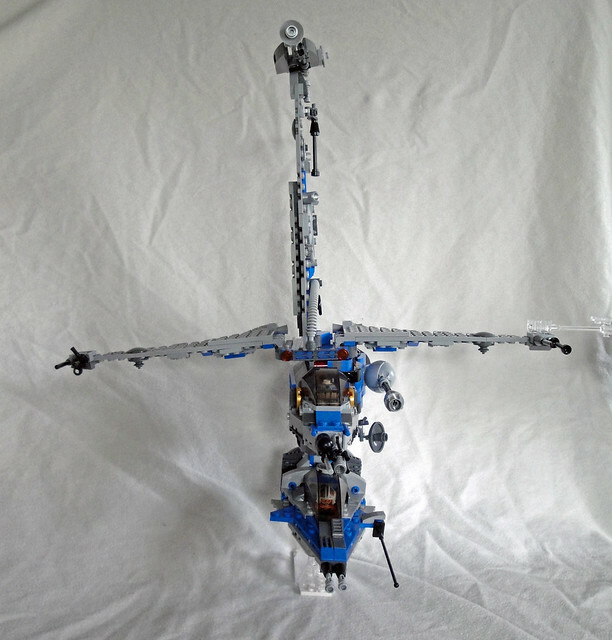 The primary airfoil supports stackable armored weapon pods; mount half a dozen lightweight weapons, or a few heavy ones, depending on mission and preference. (Structural limitations may apply.) 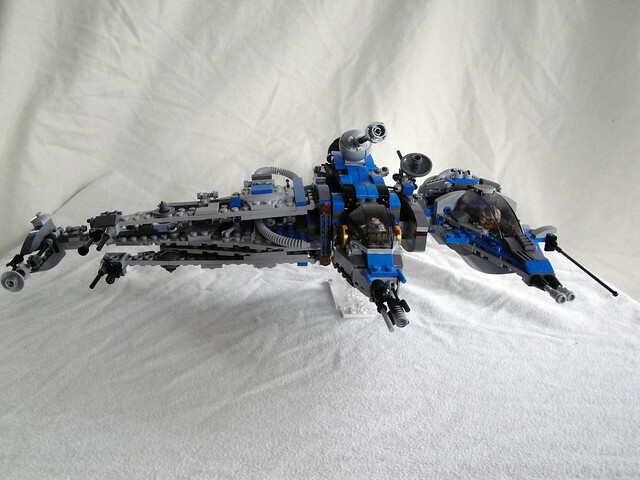 The S-foil weapon pods are not stackable, but are similarly armored. 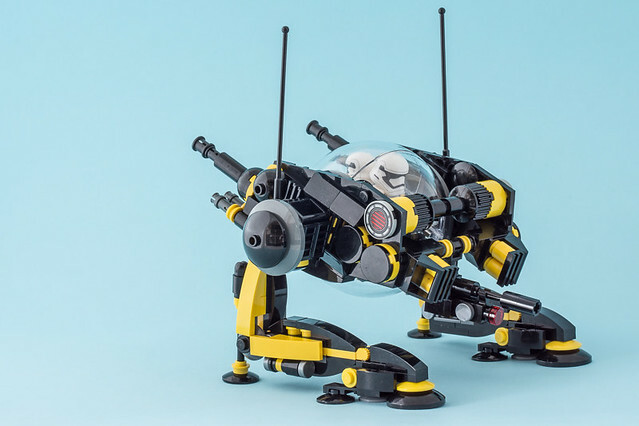 The cab-forward see-around cockpit and droid slot are combined into an escape pod with eight thrusters, itself mounted on the Gyro-stabilizer you know and love! 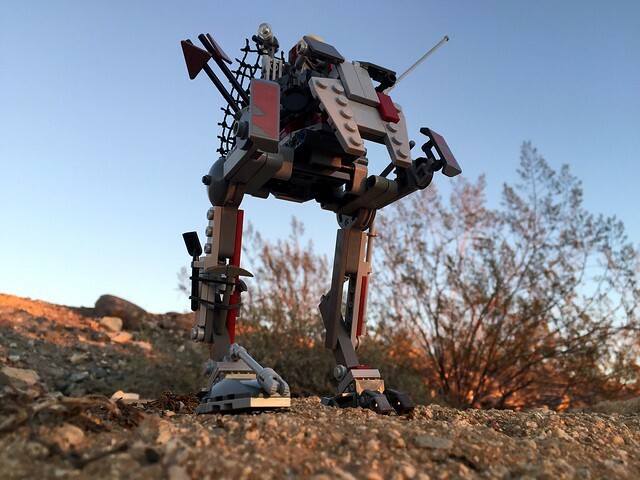 Have your integrated Nav-Computer and your favorite droid, too -- it never hurts to have a backup, does it? Your droid can target weapons and perform repairs while the integrated systems prepare your hyperspace jump -- to fame and glory! IRL: Don't try this at home! 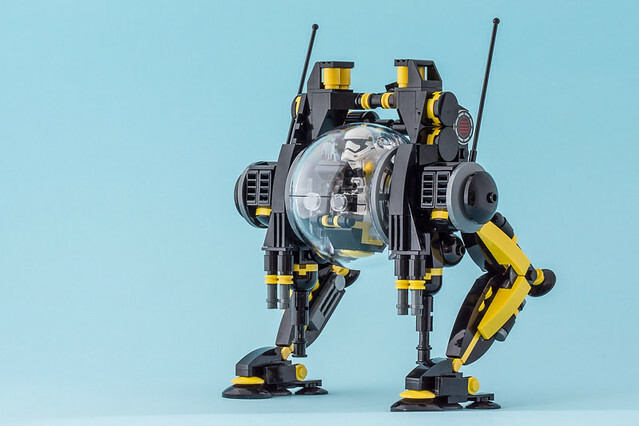 Technic treads were a terrible idea, they just love to pop loose while posing for photos, spilling precious B-Wing bits all over the floor. 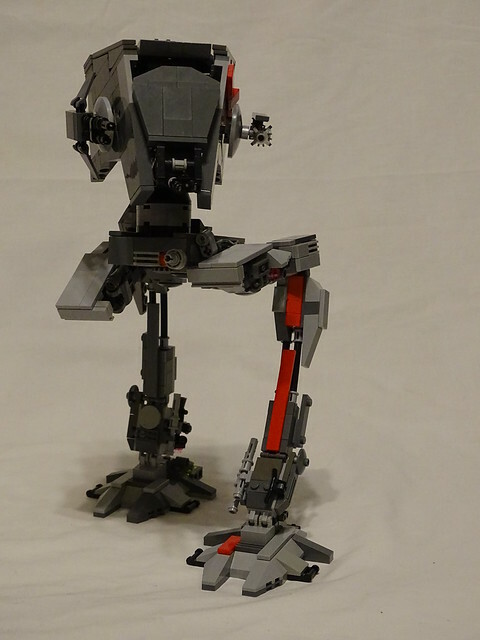 Solo: thank you for requiring the hoses to be standard lengths, it forced me to find an alternate solution to attaching bricks to Technic treads -- bucket handles and the new round tile with pin on top. It was actually more secure than the original design! Sorry for the last minute change. 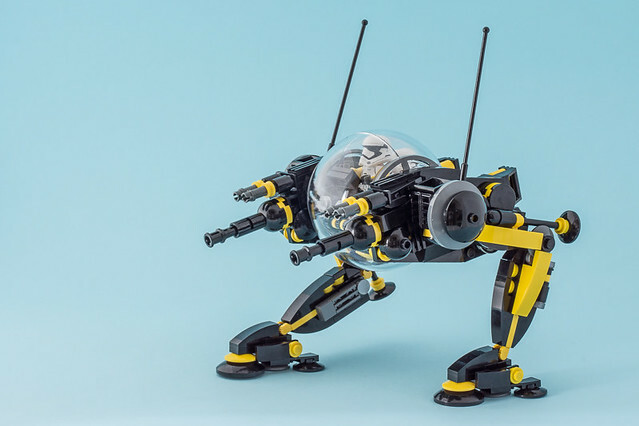 I really wanted to enter with an updated Sebulba pod after starting Racer Revenge but due to work I didn't have time until today to actually build something. 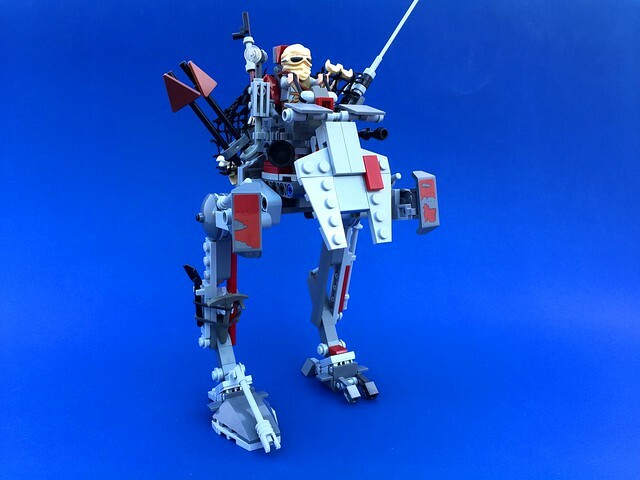 I updated my original post, hope you guys like this model.